ROCHESTER, N.Y. — Nate Hampson (Victor) turned in his best outing of the season, and Brennen Smith (Webster Thomas) was nearly immaculate. It wasn’t enough, though, as the Monroe Community College baseball team dropped a pair to Northampton Community College (0-1/3-7) in NJCAA action at Tribune Field. Hampson hurled four shutout innings before allowing a run on two hits in the fifth inning of Sunday’s opener The freshman left-hander struck out four, walked one and allowed four hits over 4.2 innings. 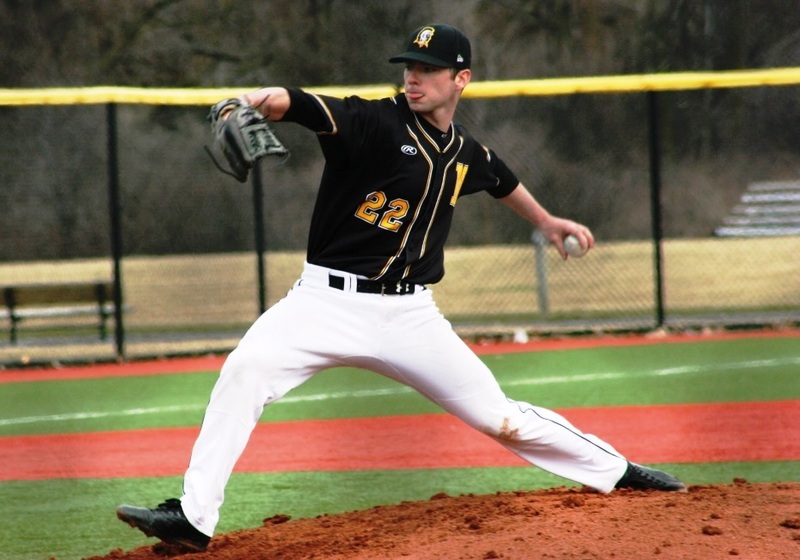 Hampson went five on March 23rd in an 18-4 win over Utica College JV. On Sunday against the fourth-ranked (NJCAA DIII) Spartans, he set down five of the first six he faced and six of seven batters between the third and fourth innings. Smith tossed one inning of relief in the nightcap and was spectacular. The left-hander set down all three batters he faced on strikes falling two pitches shy of an Immaculate Inning. The Tusculum University commit retired the first two batters of the inning on three strikes apiece – getting both looking. Smith went 0-2 on CJ Gantz before Northampton’s leadoff man fouled away a pair of pitches. Smith got Gantz on off-speed pitch to end the inning. Jose Ramos (Poinciana/Kissimee, FL) finished 3-for-3 with an RBI in game two. The sophomore right fielder doubled home Trey Brown (Aquinas) in a two-run sixth inning. TJ Lucey (Fairport) followed with his second RBI single of the game to pull Monroe with two at 5-3. Northampton’s Brandon Ernst connected on a two-run home run in the top of the seventh. Monroe loaded the bases in the home half but could not capitalize. Casimer Sobaszek (Rush-Henrietta) and Sam Loew (Binghamton) both had two hits in the second game. Loew finished with four base raps on the afternoon. Ramos and Sobaszek had three apiece. Monroe loaded the bases in the fourth inning of game one when Loew singled. Ryan Hill (Webster Thomas) and Brown walked. MCC travels to play regional foe Mercyhurst NE on Tuesday.